Si Emily "Cissy" Houston (née Drinkard; ipinangank noong Setyembre 30, 1933) ay isang Amerikanong mang-aawit ng soul, at gospel. Siya ay naging isang backup singer kina Elvis Presley and Aretha Franklin, ngunit naging isang solo artist, at nanalo ng dalawang Grammy Awards. 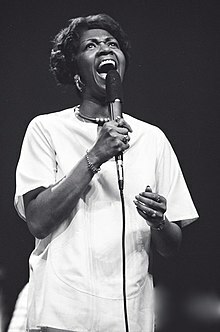 Siya ang ina ni Whitney Houston, tiyahin nina Dionne at Dee Dee Warwick, at pinsan ni Leontyne Price. 1996 A Time to Kill "Take My Hand, Precious Lord"
1996 The Preacher's Wife: Original Soundtrack Album "The Lord Is My Shepherd"
1998 Late Show with David Letterman, December 23 episode "Christmas (Baby Please Come Home)"
2007 Daddy's Little Girls Original Movie Soundtrack "Family First"
1965 The Exciting Wilson Pickett Wilson Pickett "In the Midnight Hour"
1967 Electric Ladyland The Jimi Hendrix Experience "Burning of the Midnight Lamp"
1968 Lady Soul Aretha Franklin "Ain't No Way", "(Sweet Sweet Baby) Since You've Been Gone"
1971 Paul Simon Paul Simon "Mother and Child Reunion"
1971 Movin' On Oscar Brown, Jr.
1972 The Divine Miss M Bette Midler "Do You Wanna Dance?" 1974 I've Got the Music in Me Kiki Dee "I've Got Music in Me"
1974 The Doctor Is In... and Out Yusuf Lateef "Technological Homosapien"
1974 Young Americans David Bowie "Young Americans"
1978 Chaka Chaka Khan "I'm Every Woman"
1980 Naughty Chaka Khan "Clouds"
1980 Naughty Chaka Khan "Papillion (Hot Butterfly)"
1981 Freeze Frame The J. Geils Band "Angel in Blue"
1990 Some People's Lives Bette Midler "From a Distance"
1995 This Is Christmas Luther Vandross "This is Christmas"
2003 Dangerously In Love Beyoncé "Dangerously In Love 2"
↑ "Drinkard Singers". Biography. Artist Direct. http://www.artistdirect.com/nad/music/artist/bio/0,,566926,00.html. Hinango noong February 21, 2012. ↑ "MUSICA DESDE LAS ANTIPODAS". The Doctor Is In...And Out. brownweb. Sininop mula sa orihinal na pahina noong March 4, 2009. http://web.archive.org/web/20090304181541/http://musicadesdelasantipodas.blogspot.com/2008/10/yusef-lateef-1974-doctor-is-in-and-out.html. Hinango noong February 12, 2012. ↑ "Chaka Khan - Clouds". Clouds. JazzFunkster444. http://www.youtube.com/watch?v=xADrCKYUEcc. Hinango noong February 21, 2012. ↑ "Chaka Khan - Papillion (Hot Butterfly)". Papillion (Hot Butterfly). p4soul. http://www.youtube.com/watch?v=KJEIQX9d4kY. Hinango noong February 21, 2012.